TROPIMUNDO is an EC-funded and excellence-labelled Erasmus Mundus Masters Course in Tropical Biodiversity and Ecosystems. We aim to bring together expert Higher Education Institutes (HEI), with long-standing worldwide expertise in tropical rainforests and woodlands and in tropical coastal ecosystems. TROPIMUNDO students are able to concentrate on botany, zoology and integrative ecosystem approaches in institutions worldwide in 2 Master years, of which an entire semester is spent in the tropics. 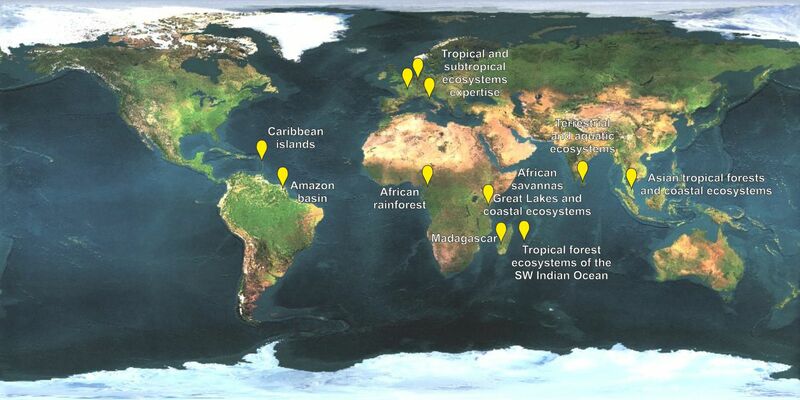 Specialisation is possible on the evolution of tropical flora and vegetation, on faunistic assemblages, on informatics tools to treat and manage biodiversity data and databases (biogeographical, genetical, geographical information systems) including the management and conservation of historic collections such as herbarium sheets, on the study of diversity, dynamics and evolution of tropical and subtropical ecosystems (with a focus on four related systems, namely tropical rainforests and woodlands, mangrove forests, seagrass beds and coral reefs, including the interactions between flora, fauna, man and the environment within and between each of these adjacent ecosystems), on conservation and restoration ecology of natural habitats and their biodiversity including competences in sustainable management and governance of biodiversity, and finally, on tropical ethnobotany, exploitation and valorisation of natural resources and conservation of traditional ecological knowledge. Click here to get your personal link to the online Information and Application Module (see also blue frame at the right of this screen). The information in this website may be subject to changes from one year to another. The second call for 2019-2020 self-funded applicants is now open. This first TROPIMUNDO call was for scholarship seekers or self-funded applicants and was evaluated as a batch after the deadline in December 2018. As available places remain, a second call for TROPIMUNDO applications was opened in the first trimester of 2019 (presently OPEN), only for self-funded applicants from all countries. Second call applications will be treated on a first come first served basis. The deadline for submission of second call applications will be 15 June 2019 for Non-EU and for EU students (preferably originating from one of the member states of the European Union and with a Bachelor diploma obtained from an EU member state) or until all available places have been exhausted. The consortium is composed of 8 institutes in Programme Countries (European) and 4 higher education institutes in Partner Countries (non-European). In a first semester, students start at a European institute of their choice to acquire similar competences. In a second semester field experience and courses will take place in a university in a tropical area. The third semester will cover a specialisation in a European university different from the first semester. The fourth semester is dedicated to the MSc Thesis and students return to where they started out. Every Trajectory of 4 semesters constitutes a unique combination of courses and expertises. Tuition fees are 9,000 EUR per year for students from Partner countries (largely outside Europe) and 4,500 EUR per year for students from Programme countries (largely European). Self-funded students will receive a restitution of 500 EUR for each 4500 EUR paid. They are to be paid to the coordinating institute. The tuition fees include consortium enrolment fees and the insurance cost. The tuition fees do not include costs related to visa and preparatory documents, accommodation, additional insurance costs, living expenses and travel and transportation costs. However, EC-funded students have additional cost coverage.Find more information here. TROPIMUNDO Candidates can also apply for an EC scholarship open to applicants from all nationalities. Applications are scrutinised based on excellence criteria (see below). The following information sections are extracted from the online Information and Application Module. The TROPIMUNDO Best Student Award, awarded to the student with the highest overall course average. The Lorenzo Borella Memorial Award, awarded to the student with the highest thesis mark. The eponymy is in loving memory of the TROPIMUNDO alumnus Lorenzo Borella and is described here in English, Italian, French and Dutch). This award was originally named the TROPIMUNDO Best Thesis Award. External prizes awarded to TROPIMUNDO theses are also indicated below. TROPIMUNDO students and alumni have the opportunity to become a member of theErasmus Mundus Association - EMA. MONDRAGON BOTERO, Gladys Ariadna Forest structure, composition and functional diversity of a tropical dry gallery forest at Berenty Reserve, Madagascar. OÑATE CASADO, Javier Effect of tidal surface currents on the offshore hatchlings dispersion. A comparative study among green and hawksbill turtles on Chagar Hutang Turtle Sanctuary, Pulau Redang, Malaysia. RANDRIANIAINA, Heritiana Ethnoecology and analysis of the effectiveness of community-based mangrove management (CBMM): a case study of the Andrevo and Ambondrolava mangroves in southwestern Madagascar. TALUKDER, Rasendra Source identification and ecological risk assessment of heavy metal pollution in sediments of Setiu Wetland, Malaysia. BONNEFOND, Anaïs Are tropical anurans able to adjust their calling behavior to changing hydric environments? BEN SAADI Celina Prey catch selectivity and pitcher infaunal community composition in two Nepenthes species in Peninsular Malaysia. CIPRIANI Vittoria Is the dietary variation related to changes of the venom composition in the Australian brown snakes (Pseudonaja sp.)? GUILLEN OTERO Thais Diversity and functionality of arbuscular mycorrhizal fungi: A comparison between restored and natural ecosystems in ultramafic soils of New Caledonia. Application to ecological restoration. NORTHCOTE Sally-Jane Behavioural ontogeny, communication and social interactions between Humpback Whale Mother and Calf (Megaptera novaeangliae) during the breeding period in the Indian Ocean. CAMPERIO CIANI Giorgia Galapagos giant tortoises and farmers: coexistence or conflict? All institutes in the consortium are internationally-minded institutions with infrastructure, experience and proven results in servicing foreign students and scholars. The Local Coordinator, assisted by a Local Administrative Manager, will be the single contact point for students in all matters and will act as liaison between students and the administrative departments at their institution. All European institutes also have an International Relations Office that is used to guide foreign students and researchers, providing necessary material to help them find their way in the full program. The consortium aims to meet the highest quality requirements. More information on programme quality and evaluation is available from the Online Information and Application Module.